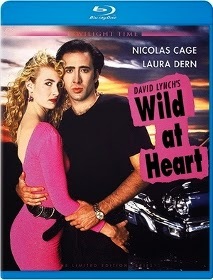 David Lynch’s 1990 bizzaro road movie/comedy Wild at Heart arrives on Blu-ray in the form of a limited edition release (only 3,000 copies pressed) courtesy of boutique label Twilight Time. The ultra-violet, hyper-sexual adaptation of Barry Gifford’s novel of the same name holds up as one of the strangest quasi-mainstream movies ever released. It also has the not-insignificant distinction of being writer-director Lynch’s most approachable film (outside of the G-rated The Straight Story). Lynch riding a white-hot peak of popularity and influence when Wild at Heart was released. It was his long-awaited follow-up to Blue Velvet (for which he was recognized with an Oscar nomination), released as his Twin Peaks instigated a revolution by helping re-define what a network television show could be. Though it was met with a wave of mixed reviews a lackluster box office, Wild at Heart is essential. From a purely narrative standpoint, Wild at Heart is notable for having a plot that is secondary to tangential episodes and unpredictable character tics. Sailor Ripley (Nicolas Cage, channeling Elvis Presley throughout – he even sings a pair of the King’s hits) and Lula Fortune (Laura Dern, singeing the screen with raw, carnal passion) are star-crossed lovers on the run from the law. Sailor is in violation of his parole terms, having served a stretch in Pee Dee Correctional Institute for manslaughter. The victim was a man who Lula’s mom, Marietta (Diane Ladd, Oscar-nominated here), had sent to kill Sailor, so the “crime” was more or less in self-defense (though Sailor’s vicious retaliation was inarguably excessive). The young lovers are also on the run from Marietta’s henchman: the truly dangerous Marcellus Santos (J.E. Freeman) and her more benign boyfriend Johnnie Farragut (Harry Dean Stanton, the calm at the center of the storm). Marietta will stop at nothing to keep Lula away from Sailor, who knows too much about the Fortune family’s twisted past. The details are, honestly, a bit muddled. It hardly matters. Lynch has created a cuckoo world, filling every frame with surprising, funny, surreal, sometimes shocking details. By the time Sailor and Lula’s odyssey lands them in Big Tuna, Texas, where they meet the unhinged contract killer Bobby Peru (Willem Dafoe, delivering one of his career-best turns), Lynch is firing on all cylinders. Twilight Time’s Blu-ray is basically an upgrade of the now-dated transfer used for the 2004 special edition DVD. It would’ve been far preferable for MGM to have supplied them with a brand spanking new restoration, but Twilight Time can only work with what they are given. As it stands, there is noticeable print debris that creates some level of minor distraction. Clarity and detail are not what we’re used to in the best high-definition presentations. But it’s an acceptable image overall, if ultimately disappointing. Better is the DTS-HD MA 5.1 soundtrack, a lossless mix that provides a clear upgrade over the previous DVD’s lossy Dolby Digital mix. The LFE channel booms, especially when hard rock blares forth or whenever fires blaze (which occurs fairly regularly in this film). There’s also a DTS-HD MA 2.0 option. Besides Twilight Time’s customary isolated music track and a typically good booklet essay by film historian Julie Kirgo, the special features are all ported over from the old DVD (including the now unnecessary “David Lynch on the DVD” featurette). There’s some good behind-the-scenes and interview material for those who haven’t seen it before. Wild at Heart is driven by an ambience all its own. I didn’t even mention the whole Wizard of Oz fixation that Lynch interjects throughout, mostly because it isn’t a somewhat unsuccessful aspect of the film. There’s already enough weirdness here without the constant references to Marietta as the Wicked Witch (although Sheryl Lee, Laura Palmer in Twin Peaks, has a classic cameo as Glinda the Good Witch). The worst that can be said about Wild at Heart is that it doesn’t add up to a genuinely moving experience. The jokiness somehow manages to undercut any sincerity in the love story between Sailor and Lula. But taken as a comedy rather than a romance, Lynch’s film works perfectly. Visit Screen Archives for ordering information while supplies last.